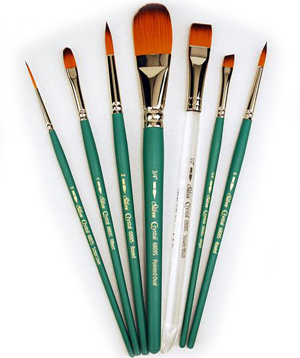 Quality artist’s brushes for watercolor, acrylics, gouche, inks and all water media. 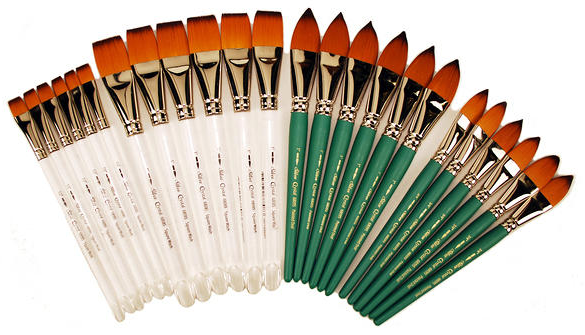 CrystalTM brushes hold a generous amount of color that releases evenly and allows the brush to glide smoothly over paper. Manufactured with our exclusive durable brown-tip golden filaments that are set into nickel-plated double crimped brass ferrules and fitted to beautifully balanced short matte teal handles. 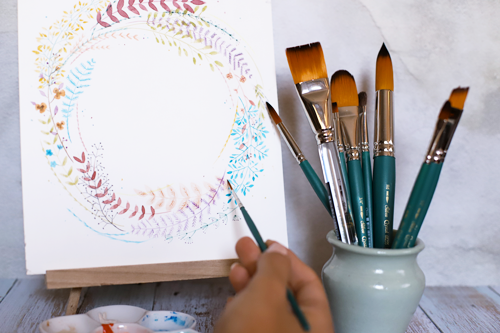 Series 6808S Wash has clear acrylic handles with beveled tips for scraping and separating sheets from a watercolor block. 6814S Wide Wash - Backgrounds, washes, landscapes | Sizes: 1", 2", 3"
​Includes 1 each of Round size 6, Round size 8, and Square Wash size 1/2"
Includes 6 each of Square Wash size 1/2", Square Wash size 1", Pointed Oval size 3/4" and Pointed Oval size 3/4"
​Includes 1 each of Angle size 1/4", Angle size 3/8" and Angle size 1/2"
1 Each of Script Liner size 0, Filbert size 4, Round size 6, Round size 8, Pointed Oval size 3/4", Square Wash size 1/2", and Angle size 1/4"